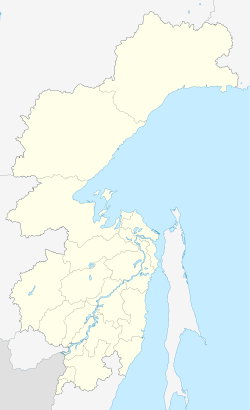 Menshikov Island (Russian: Остров Меньшикова; Ostrov Men'shikova) is an island in the Sea of Okhotsk located east of the Shantar Islands. Menshikov Island lies 71 km to the east of the eastern shore of Kusov Island, the easternmost island of the Shantar group. It is 7 km long and has a maximum width of 1.6 km. It was named after one of the ships of the 1849-1855 Amur Expedition, which had been named after Admiral A.S. Menshikov. American whaleships sent whaleboats to the island to collect eggs from seabirds. They called it Bird Island. ^ Montezuma, of New London, June 27, 1858, Nicholson Whaling Collection. This page was last edited on 12 February 2018, at 18:21 (UTC).